Abu Dhabi: Rashid Ahmad Al Beloushi won the Abu Dhabi Endurance International Cup for junior and young riders at the Boutheib Endurance village in Al Khatem on Friday to follow in the footsteps of elder brother Yousuf, a champion rider and trainer. Last week, the elder brother made Al Reef Stables proud when he scored another one of his famous wins in Dubai and yesterday it was the 15-year-old Rashid tasting his second success on 13-year-old Jen A Dale Zamarah in the 100-km event. Rashid Ahmad and Jen A Dale Zamarah completed the four-loop 100-km ride in 4 hrs 10 mins and 12 seconds nearly six minutes ahead of Hamdan Mousa Mohammad Al Hammadi and Abdullah Rashid Mohammad Saeed Al Naqbi, who took the second and third places respectively. Rashid Ahmad's horse was trained by Yousuf Ahmad Al Beloushi and the youngster thanked his elder brother and others. The FEI Task Force Chairmen met for four days, from 21 to 24 February, to agree on the final recommendations for the new FEI Endurance Rules for 2009 and onwards. Far reaching changes are recommended by the Task Force that has consulted widely with all those involved in the discipline over the last year following their creation immediately after the FEI World Endurance Forum held in Paris, February 2007. FEI Technical Committee members will now have an opportunity to review the Task Force proposals ahead of their annual meeting scheduled for early April in Switzerland. At this meeting the Committee will add their own comments and input to the proposed new format. The detailed proposals from the Task Force, together with the full input of the Technical Committee, will then be circulated to all FEI Federations. Full details will also be published on the FEI Web site at that time. Feedback from National Federations will then be requested and such feedback, where appropriate, will be incorporated into the final proposed FEI Endurance Rules for 2009. This final proposal will then be circulated to all FEI NFs for last review. Formal approval of the new rules will be carried out at the FEI General Assembly in Argentina in November and, if so approved, will come into force in January 2009. The Task Force meeting, to which all Divisional Chairs from around the world attended, was kindly hosted and supported by the Dubai Equestrian Club. Additionally the ongoing work of the Task force over the last twelve months has been supported by The Royal Jordanian Equestrian Federation. One of the Task Force Chairmen commented ‘This truly is the very best and most full playing field attempt to update our rules since this all started……….. I am left feeling very proud of work like this’. The FEI would like to express it's gratitude to all of those who have contributed to the process so far and have given so much of their time and effort to this review. The review is an opportunity for those directly involved with the discipline to create a sound foundation upon which FEI Endurance can continue to grow in the years to come. Abu Dhabi: In a rare repeat show, Yousuf Ahmad Al Beloushi finished ahead of Spain's Maria Alvarez Ponton in the Shaikh Maktoum Bin Hamdan Bin Rashid Al Maktoum Challenge 120-km endurance ride at the Emirates International Endurance Village in Dubai on Saturday. The defending champion, who had won this ride last year on Cameo Zinniaa, decided to partner Roherty Bold Impression and the 10-year-old Anglo-Arab gelding did extremely well to overtake Maria on Antares Sauveterre on the final loop and help the Al Reef star to finish the endurance season in Dubai the way he started it - on a winning note. Yousuf Ahmad Al Beloushi celebrates his victory in the Shaikh Maktoum Bin Hamdan Al Maktoum Challenge last year. Abu Dhabi: Precisely a year ago, Yousuf Ahmad Al Beloushi on Cameo Zinniaa finished ahead of Spain's Maria Alvarez Ponton in the 120-km second Shaikh Maktoum Bin Hamdan Al Maktoum Challenge endurance ride at Dubai International Endurance City. The two riders are back on the same horse for the third edition of this ride which gets off to a mass start at 6am this morning and will be joined by over 100 other riders. While the two rider will be looking to again do well in the event, sponsored by Shaikh Hamdan Bin Rashid Al Maktoum, Deputy Ruler of Dubai and Minister of Finance, there is also another reason the two will be hoping to better each other. In the latest FEI World Ranking (calculated up to December 2007) Maria leads with 1,784 points followed by Frenchman Jack Begaud (1581) while Yousuf is third on 1044. Both Yousuf and Maria also completed this event in its inaugural edition in the 2005-06 season with Yousuf finishing 10th and Maria 34th. Other top riders in the fray include Pan Arab Games Shaikh Mayed Bin Mohammad Bin Rashid Al Maktoum. The Shaikh Maktoum Bin Hamdan Al Maktoum Challenge over 120-kms will be run in five loops of 31, 32, 27, 18 and 12 kms each. An 82-km Qualifier ride with 31 riders and a 44-km Qualifier with 35 riders will also be held today at the Dubai International Endurance Village in Seih Assalam. The total prize money on offer is Dh550,000 which will be distributed among the top 20 who finish the ride while the winner will also drive away with a Nissan Patrol Car. The first 10 horses finishing within one hour of the first-placed horse will be eligible to enter the Best Condition Competition while Dh 50,000 will be given away as cash prizes to the public through a free raffle. Abu Dhabi: Their interests are common as they are passionately involved in the sport of endurance. Though both hail from Spain they had never met until in 2001 in Dubai and seven years later they have not only exchanged vows but progressed into world class riders. FINALLY RECOGNISED: John Howe with the recognition he waited more than 17 years to receive. Endurance rider John Howe was recognised for a rare achievement, some 17 years after the event, when he attended the annual general meeting of the NSW Endurance Riders Association on Saturday, February 9. Howe was the first ever endurance rider to complete the Tom Quilty, Shahzada and the NSW State Championships on the one horse back in 1991. In 1991, in the days before riding helmets were a compulsory part of an endurance riders’ equipment, Howe rode his 16HH American Saddle Horse ‘Beau Gallant Omen’ to complete all three rides. "At the time Beau was a 9YO and I started with the 160 kilometres of the Tom Quilty on the June long weekend, then in August completed the 400 kilometres of the Shahzada and in October the 160 kilometres of the NSW State Championships at Mt Macquarie near Blayney," Howe said. "I may never have attempted the feat if it hadn’t been for the late Paul Grieve, who was a great endurance rider. "I asked if there was one thing he would like to do in his lifetime and he said he would like to complete these three events with one rider, one horse in the same year. "Paul never got his wish so I set out to achieve it for him. "To get over the line in all three events Beau had to pass 22 fitness tests on 22 occasions during the three rides and I’ll never forget the relief when the vets pronounced him fit after I crossed the finish line at Mt Macquarie. "I decided to run the horse out myself for the last vet check as tired as I was and all the vets were there as well as a lot of endurance enthusiasts. "I ran him out and then when I brought him back I felt him surge in his movement and felt confident he would make it - to this day it was my biggest thrill in the sport. "Since 1991 only 10 people have been able to emulate the feat and at this year’s AGM at Port Stevens all 10 of us were presented with a special Big 3 award. "Endurance riding is about completing the course safely and the horse being fit at every veterinary check point, including the final one." Endurance riding has been at a standstill since the Equine Influenza outbreak forced the cancellation of the 2007 Shahzada last August. The sport returns to the Mudgee district when the Mudgee Endurance Club hosts their 2008 race ride from the popular Cooyal base on May 18. A reporter with Britain's BBC is to ride in a division of the Golden Horseshoe Ride, the country's most well-known and toughest endurance riding event. 13/02/2008 - 2008 FEI Endurance World Rankings now available! These Rankings highlight the performances of horses, and the points gained within FEI competition throughout 2008 by the individual horses. The points are distributed using the same calculations as per the Rider and Combination Rankings. Please refer to the above link for the calculation of the FEI World Endurance Rankings. The Australian Horse Industry Council has released an Equine Influenza Economic Impact Study, revealing just how significant the cost of the horse flu has been, with small communities the hardest hit. In the survey, the 2700 respondents estimated that there were losses of $29 million per week between August and December 2007. The financial assistance available through government grant payments have only offset these losses by 8.5pc, the report states. The greatest losses were in the not-for-profit sector and at the local community level. AHIC president, Dr Barry Smyth, said that if the losses estimated by the survey respondents were applied to the whole of the Australian horse industry, "then the total would be in the billions". Losses were significantly more than those estimated in a previous survey conducted in September 2007, Dr Smyth said. The positive news is that the efforts to control the Equine Influenza outbreak and eradicate it from Australia seemed to have been successful, with no new cases reported in 2008. Round II - Al Asayl Ladies’ Race sets New World Record! Friday 8 February saw an exciting Second Round of the HH Sheikh Sultan bin Khalifa Al Nahyan Challenge. 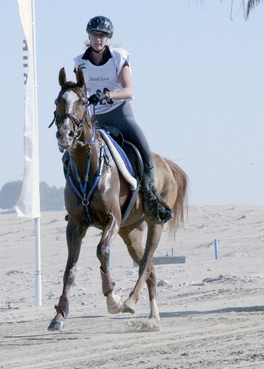 This three part series, held at the Al Asayl Endurance Village, Sweihan near Abu Dhabi, is specifically for Lady Riders. This is the second year the Challenge has been run and its ever increasing popularity is clear by the rise in the number of entrants. Friday’s race saw 34 ladies set off into the chilly dawn of the day. Thirteen nationalities were represented with competitors from as far afield as New Zealand, Australia, South Africa and Canada. The top 5 finishers completed the 100km at over 26kph. The race was won at an average speed of 26.18kph, the fastest time recorded for an Open FEI 2* 100km Endurance Event. This is the second World Record to have been beaten in 2008. Omair Hussein Al Bloushi broke the 160km World Record in Dubai earlier this year finishing at an astonishing 24.71kph. The same combination hold the World Record for the fastest speed in a Young Rider FEI 2* 100km Endurance Event, 26.32kph – just 1 minute 51 seconds faster than the the finishing speed on Friday. Reem Shaban Ibrahim Hasan (UAE) rode her mount for the day, Rivendell Sharman from Al Reef stables, into 2nd Place. This 14 year old Chestnut gelding, bred in Australia, was going for his 6th completion over a desert course and put in a great performance ensuring his 2nd top 3 placing for Al Reef Stables. Third place went to another British rider Kayleigh Smith, on Stanpark Trooper, a part bred Arab Gelding also owned by Sheikh Hamdan bin Rashid Al Maktoum. Of the 34 starters, 16 ladies finished giving an overall completion rate of just over 47%, a most impressive number given the highly competitive nature of the HH Sheikh Sultan bin Khalifa Al Nahyan Challenge. The third part of the Challenge is to be held on 7 March, and with a several ladies in strong contention to be the overall winner, it certainly looks to be a highly anticipated event! Abu Dhabi: Shaikh Hamdan Bin Mohammad Bin Rashid Al Maktoum, Crown Prince of Dubai, led a UAE sweep of the top three places in the H.H. The President of the United Arab Emirates Cup endurance ride yesterday. Riding Kaysand Farrazah, Shaikh Hamdan completed the gruelling 160km course in 6hrs 52mins 29 secs. Mohammad Ahmad Ali Al Subose (Kevin de Narthoux) was a close second in 6:52.30, while Mohammad Rashed Al Subosi (Genio 11) finished third in 6:57.24. Oman's Ahmad Salim Al Beloushi was fourth in 7:06.51. With Malaysia set to host the World Endurance Championships in November, some of the top riders from around the world were in action, either to prepare or to qualify for the event. However, even before the first loop of 34kms was over, four of the top contenders - Shaikh Rashid Bin Mohammad Bin Rashid Al Maktoum, Shaikh Hazza Bin Sultan Bin Zayed Al Nahyan, HH Shaikh Mohammad Bin Rashid Al Maktoum Cup winner Omair Hussain Al Beloushi and Ali Mohammad Al Muhairi had retired. In the second stage, another favourite Yousef Ahmad Al Beloushi fell by the wayside, while in the third loop, Shaikh Mayed Bin Mohammad Bin Rashid Al Maktoum also made an exit. Shaikh Hamdan was 16th after the first loop while Majid Salem Al Sabri, Ali Khalfan Al Jahouri and Oman's Ahmad Salim Al Beloushi were fighting for the top place. Shaikh Hamdan increased his pace to move into second and when the first five stages were completed he was in third. But on the final loop of 16kms, Al Jahouri's horse Aghmed went lame about two kms from the finish and Shaikh Hamdan was within striking distance to win the Dh1.5 million ride, sponsored by Hydra Properties and Emirates NBD. Shaikh Hamdan, winner of team gold medals at the European Open Championships and the 2006 Asian Games, completed a memorable day when his horse was adjudged 'Best Conditioned Horse' to bag a special cash prize. That was after he also won the key to a 4WD car for his triumph. BAHRAIN Royal Equestrian and Endurance Federation president Shaikh Nasser bin Hamad Al Khalifa congratulated UAE's Shaikh Hamdan bin Mohammed bin Rashid Al Maktoom on winning the UAE Endurance Horseride Championship held in Abu Dhabi. Shaikh Nasser praised the performance of Shaikh Hamdan throughout the race which was over 160km with more than 120 riders from the UAE and overseas in the fray. They are from the UK, Spain, Portugal, New Zealand, France, Italy, the US, Malaysia, Russia, Uruguay, Indonesia, Oman and Bangladesh. The race was divided into five stages with the first stage covering a total distance of 34 kms, 32 kms for the second, 30 kms for the fourth and 24 kms for the fifth. Shaikh Hamdan completed the race with a total time of six hours, 52 minutes and 29 seconds. Behind him was compatriot Mohammed Al Sabosi (6:52:32) in second place while Mohammed Al Sabosi (6:57:24), also of the UAE, was third. Abu Dhabi: Shaikh Hamdan Bin Mohammad Bin Rashid Al Maktoum, Crown Prince of Dubai, hailed his success at the HH The President Cup on Saturday as one of his most prestigious triumphs. "Me and my horse finishing first is a major triumph. But the bigger victory is in the fact that it is the HH The President of the United Arab Emirates Endurance Cup," said Shaikh Hamdan after his win. Shaikh Hamdan's best display in the eight-year history of the President's Cup has been a second-place finish in 2002 and sixth place finishes in the inaugural year and again in 2006. Immediately after his horse passed the final veterinary inspection and was declared the winner, Shaikh Hamdan wound a UAE flag around Kaysand Farrazah, a horse with which he enjoys a close relationship having finished fourth in the European Open Championship in 2007 (Portugal). "I dedicate this win to His Highness Shaikh Mohammad Bin Rashid Al Maktoum, Vice-President and Prime Minister of the UAE and Ruler of Dubai, Shaikh Mansour Bin Zayed Al Nahyan, Minister of Presidential Affairs, and Shaikha Fatma Bint Mansour Bin Zayed Al Nahyan," Shaikh Hamdan said. The 2008 HH The President of the U.A.E. Endurance Cup has been won by HH Shiekh Hamdan bin Mohammed al Maktoum riding Kaysand Farrazah in a time of 6:52:29. Following closely, with a time of 6:52:30, was Mohammed Ali Al Subose riding Kevin de Narthoux. The French Equestrian Federation is the first to formally apply to the FEI with a proposal to stage the 2014 World Equestrian Games. The French have proposed the games be held in the region of Basse-Normandie in Northern France with the organisers to be Amaury Sport Organisation (ASO), organisers of the world's biggest cycling race Tour de France and the annual off-road race The Dakar Rally. Horse Sport Ireland has also expressed interest in hosting the games, with sponsorship from Dr Pearse Lyons, Global President of Alltech. HSI has set up a working party but a formal proposal has not yet been received by the FEI. The FEI says that it will follow a clear and fair process in the allocation of the seventh FEI World Equestrian Games, the several procedures in place to help with decision making. In the period until October 2008, any bidders will be visited by the FEI management and technical experts to assess their technical and commercial capabilities as well as to assist the federation and organiser in the preparation of their bid and clarify any issues that may arise. Formal bids should be finalised by October 2008; the contract will be signed during the FEI General Assembly in November 2008. The bids will then be circulated to the FEI Bureau. Bidders will be asked to make a formal presentation prior to the decision by the Bureau on the host Organiser, which will be taken in the spring of 2009. Lara Sawaya, Managing Director, Tasweeq, Dr. Sulaiman Al Fahim, Adnan Sultan Al Nuaimi and Ali Mohammad Ali at a press conference to announce the His Highness President's Cup Ride at Abu Dhabi Equestrian and Racing Club yesterday. Abu Dhabi: Shaikh Hamdan Bin Mohammad Bin Rashid Al Maktoum, Crown Prince of Dubai, and Shaikh Mayed Bin Mohammad Bin Rashid Al Maktoum are expected to be part of a 100-strong line-up for the Dh1.5 million His Highness The President's Cup endurance ride on Saturday. 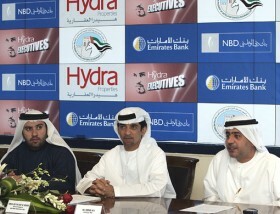 The 160-km FEI CEI three-star ride will be held at the Emirates International Endurance Village in Al Wathba and is sponsored by Hydra Properties and Emirates National Bank of Dubai. Apart from Shaikh Hamdan and Shaikh Mayed, the strong UAE representation includes Shaikh Abdullah Bin Faisal Al Qasimi, Shaikha Madiya Hasher Mana Al Maktoum, Sultan Bin Sulayem, Hassan Bin Ali, Ali Mohammad Al Muhairi, Rashed Salem Bin Ghadayer, Yousuf Ahmad Al Beloushi, Omair Hussain Abdullah Al Beloushi, Abdullah Khamis Ali Saeed and many other top riders. His Majesty Tuanku Mizan Zainal Abidin, the King of Malaysia, is part of a very strong list of foreign riders, many of whom will be using the event to prepare for the World Endurance Championship, to be held in Malaysia later this year. Top American riders John Crandell and Katherine Brunjes along with Stephen Rojek, Australia's Meg Wade, Dubai-based Spanish husband and wife pair of Jaume Punti Dachs and Maria Alvarez Ponton, French stars Virginia Atger, Philippe Benoit and Marlyn Lemoine are also in the fray. Adnan Sultan Al Nuaimi, Director General of Abu Dhabi Equestrian Club, said: "The total prize money on offer is Dh1.5 million. In addition, the winner will also receive a car. Cash prize will also be given to the best conditioned horse award winner." Dr. Sulaiman Al Fahim, CEO of Hydra Properties, said: "Hydra Properties has been in the forefront in sponsorship of various community events including sport, but this support for The His Highness The President of the United Arab Emirates Cup is a moment of great pride . "Last week Hydra Properties sponsored the His Highness The President's Cup for Juniors and we were very happy to see some of the most promising youngsters display their skill in endurance, a sport which is part of our culture and heritage." Ali Mohammad Ali, Regional Manager, Abu Dhabi, Emirates NBD, who also addressed the press conference, said: "This is the year that we are involved with the His Highness President's Cup. It is an honour for us to be among the sponsors of this prestigious event, which is taking the local and regional equestrian sport to an international level." Saturday's ride gets off to a mass start at 6am and will be run in six loops of 34, 32, 30, 24, 24 and 16 kms. Former national Dutch endurance champion Joan Eikelboom died on February 1 in Namibia. She was aged 38. Eikelboom was the national and international face of Dutch endurance for the last decade. She began riding as a teenager, and took up endurance in 1995. She gradually increased her competition distances from 80 to 160km, and in 2004 was Dutch National Endurance Champion. At the 2006 FEI World Equestrian Games in Aachen, she was one of the organizers of the support and grooming for the South African Endurance team. She died at her farm, Katjapia, in Okahandja, where she had moved to in October last year. She is survived by her busband, Ab van Wijk. The funeral took place on February 7, under the tree where she and Ab were married on December 21, 2007. A memorial service will be held in the Netherlands at a later date. Hamdan Mousa Mohammad Al Hammadi won the His Highness The President of the United Arab Emirates Cup for Junior and Young Riders at the Boud Theib Endurance Village in Al Khatem on Saturday, February 9, 2008. He was riding 11-year-old grey mare Nadja Lotoise, owned by UAE Deputy Prime Minister Sheikh Sultan bin Zayed Al Nahyan, to clinch the coveted ride and finished the distance in four hours, 48 minutes and 15 seconds. The ride which was sponsored by Hydra Properties was flagged off in the early morning at 6.30 am with 44 riders. The 120-km FEI.CEIJY three-star was run in five phases of 30 km, 30km, 24 km, 20 km and 16 km respectively. Second place went to Rashed Ajmad Al Bloushi from Al Reef Stables. He was riding nine-year-old chestnut gelding Waterlea Tuppence. Khalifa Ganem Al Merri clinched the third place riding 15-year-old grey gelding Little Joe Fox owned by Sheikh Hamdan bin Mohammed bin Rashid Al Maktoum. "I am very happy to win this prize as this is my first ever win and I have been taking part in competitions for over seven years now. Finally to win in the President's Cup is a great victory and I am very happy," Al Hammadi told the gathered media after his stupendous victory. Sheikh Khalid bin Sultan bin Zayed Al Nahyan, CEO of Hydra Properties Dr Sulaiman Al Fahim, Emirates Heritage Club's Mohammad Saif Al Neyadi and Tasweeq Managing Director Lara Sawaya were present during the prize distribution ceremony. The 160-km The President's Cup will be held on Saturday February 16, 2008, at the Emirates International endurance Village, Al Wathba. ROYAL Team captain Shaikh Nasser bin Hamad Al Khalifa was crowned winner of the 160km race in the Endurance Horseride Championship yesterday. The Shaikh Nasser bin Hamad Endurance Horseride Championship, which was held at the Bahrain International Endurance Village in Sakhir, comprised two races - 160km and 100km - besides two qualifying races for new riders over 85km and 65km. The 160km race, which was a qualifier for the World Cup in Malaysia next year, was dominated by Royal Team riders as Shaikh Nasser steered Raushkan to a first-place finish in seven hours, 48 minutes and seven seconds. Behind him was runner-up Ahmed Abdulla in 7:48:10 while Ghazi Al Dossary took the third place, completing the race with a total ride time of 7:48:33. 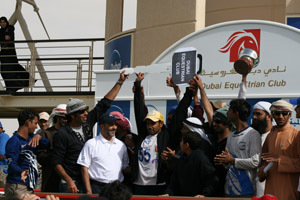 In the 100km race, Tawfeeq Al Ghattan of Hawar Stables clinched the trophy in four hours, 49 minutes and 56 seconds. Al Ghattan was followed by Abdulla Al Dossary of Al Asayel Stables in 4:55:54 and head of Al Fateh Stable rider Shaikh Saqer bin Khalid Al Khalifa finished third in 5:00:02. Meanwhile, His Majesty King Hamad attended part of the championship and was welcomed on arrival by Shaikh Nasser and representatives of the championship sponsors, Durrat Al Bahrain, as well as Bahrain Royal Equestrian and Endurance Federation officials. Shaikh Nasser presented a briefing to His Majesty on the championship races and their stages. His Majesty congratulated the winners in each race and wished the others success in future competitions. His Majesty also lauded the efforts of the federation officials in organising the competition and Durrat Al Bahrain for their sponsorship. The event was also attended by Durrat Al Bahrain chairman Abdulhakim Al Khayyat and General Organisation for Youth and Sports president Shaikh Fawaz bin Mohammed Al Khalifa who presented trophies to the winners. 160km: 1 Shaikh Nasser bin Hamad Al Khalif (Raushkan, 7:48:07); 2 Ahmed Abdulla (Barakah Bar, 7:48:10); 3 Ghazi Al Dossary (Maxico, 7:48:33); 4 Yusuf Tajer (Paula, 7:48:51); 5 Raed Mahmood (Willo Bint Khyberie, 7:48:55); 6 Sh. Daij Al Khalifa (Endrea 765, 7:48:58); 7 Mohmmed Abdulaziz (Hanneliza Baron, 7:51:16); 8 Shaik Khalid Al Khalifa (M K Whiskey, 7:51:49). 100km: 1 Tawfeeq Al Ghattan (Aqaba St Nicholas, 4:49:56); 2 Abdulla Al Dossary (Hard, 4:55:54); 3 Shaikh Saqer bin Khalid Al Khalifa (Prince Charming, 5:00:02); 4 Isa Al Ghattam (Silver, 5:19:00); 5 Muthlaq Al Muhannan (Dirham El Oumzil, 5:31:03); 6 Mohammed Ismail (Reemir, 5:51:58; 7 aqcoob Yousif (Mehboob Taj, 7:38:26; 8 Andrew Scoop (Muniki, 7:52:05); 9 Laura Lewi (Bahrain, 7:52:13). Abu Dhabi: Sue Sidebottom of Great Britain staved off a stiff challenge in the final loop of 16km to win the second round of the Shaikh Khalifa Bin Sultan Al Nahyan Challenge 100-km ride for Lady Riders sponsored by Sorouh and held at the Al Asayel Endurance Village in Sweihan on Friday. Sue, who is a key member of the Dubai Equestrian Club's endurance organising committee, notched up her first ever win on Fenwick Cadenza and the pair, who finished 5th in the First Round, are now in contention for the overall championship award. Sue led in all the loops but in the final loop she was challenged by First Round winner Afra Khalifa Al Suwaidi, fellow Briton Kayleigh Smith and Aliya Ali Mohammad Yousuf Al Marzouqi. But Sue held on to win the ride with Reem Shaban on Rivendell Sharman finishing just ten seconds behind her and Smith third, a further 29 seconds adrift. "I'm over the moon. This is my first ever win and I am delighted," said Sue after receiving her trophy and Dh30,000 cash prize for her winning effort. "On the final loop, I was almost passed by two riders, but Fenwick Cadenza came up with that extra effort," said Sue. Afra, who won the opening round, also becomes a leading contender with her fourth-place finish yesterday along with Smith, who has a 4th and 3rd place finishes in the two rounds. Shaikh Mohammad Bin Abdullah Bin Zayed Al Nahyan, Shaikha Fatma Bint Abdullah Bin Zayed Al Nahyan, Shaikh Khalifa Bin Sultan Bin Khalifa Al Nahyan along with Tasweeq managing director Lara Sawaya and Sorouh's Azadi gave away the trophies. STAGES have been announced for the Shaikh Nasser bin Hamad Endurance Horseride Championship scheduled for tomorrow. The event gets underway at 6am at the Bahrain International Endurance Village premises in Sakhir. It consists of four races, including 160km and 100km for seniors besides two qualifying race over 85km and 65km. The 160-km race consists of six stages, including 30 km for the first three stages, 25 km for the fourth and fifth while 20km is set for the six and last stage. Four stages were approved for the 100-km race which featured 30km for the first two stages, 25km for the third and 15km for the fourth. In the qualifying races, which will be organised for new riders and horses, the 85-km event will be split into three stage, including 30km each for the first two stages and 25km for the third. The 60-km race will be divided into two identical stages of 30km each. The veterinary examination is set for today at the race venue to be attended by Bahrain Royal Equestrian and Endurance Federation president and event patron Shaikh Nasser bin Hamad Al Khalifa. Meanwhile, the organising committee announced members of its working committees for the championship. The judging committee is headed by Bahrain Royal Equestrian and Endurance Federation general secretary Ghalib Al Alawi and includes Breef second vice-president Shaikh Khalid bin Abdulla Al Khalifa, Haider Al Zo'bi, Abdulsamad Al Busta, Haider Rafii and Ali Ghuloom. The official steward is Sondra Babo of India who will be assisted by Mohammed Dadulla, Mahmoosd Abdulsaheb and Fahad Al Rumaihi. Dr Mohammed Al Hammad of Sauid Arabia will head the veterinary committee which consists of members from India, France, Bahrain and the Dominican. For more information about the USEF and/or the sport of Endurance contact Endurance contact Vonita Bowers at vbowers@usef.org. A British endurance team took gold in Rajasthan's inaugural 50km International Invitational Endurance Championship on 28 January, the first of its kind in India. Britain's Lesley-Ann Parker took individual gold and Fiona Griffiths silver, with Caroline Moorey and Bryony Dickins making up the rest of the team that fought off competition from France, Sri Lanka and India. Endurance GB, the governing body for the sport of endurance riding in Great Britain, has donated £1000 to Redwings Horse Sanctuary to support the work that the charity is doing treating horses rescued from Spindles Farm in Amersham. World titles will be up for renewal and grabs this year as the 12th FEI World Endurance Championship edge their way closer. Indeed, from 6 to 9 November 2008, Terengganu in Malaysia will be host to defending, aspiring and future World champions. These dates have been chosen in order to acknowledge combinations that have performed at the highest level over these last two years (FEI World Equestrian Games and FEI European Championships) and to also comply with the required time frame for quarantine issues into Malaysia. Local high school teacher Clare Fleming has reached the top in the Queensland Endurance Riders Association pointscore for 2007. This ranked her as Queensland's most successful Lightweight Endurance Rider. The next competitor, Karen Hamelink, scored 31.5 points. Without a grey Arab gelding known as Mangueira Moksha and a dark bay mare known as Birramalee Queen of Hearts, Clare’s success would not have been possible. Together, these two horses clocked up around 1000 kilometres doing competitive endurance rides last year. Clare rides competitively, and usually finishes in the top five placegetters of a ride. In 2007, she won the Lake Manchester Ride, the Spring Mountain Ride, the Bungawalbyn Forest Ride and the Eden Creek Ride. Endurance riding originated in the United States , where cavalry horses where tested for strength over long distances, and came to Australia in around 1966. It is the fastest growing equestrian sport in the world. It is hugely prestigious in the Middle East , where sheiks spend up big to enjoy the privilege of racing and riding their own horses. Recently, His Highness Shaikh Mohammad Bin Rashid Al Maktoum, Vice-President and Prime Minister of the UAE and Ruler of Dubai, hosted the world’s most valuable endurance race. While Australia does not allow prize money, there are special awards for placegetters. Clare emphasised that while endurance rides are a race, her main goal is to complete the ride with a sound, healthy horse. In fact the motto of the Australian Endurance Riders Association is: "to complete is to win ". Photo: Sorouh Salem Juma Al Ketbi (left) President of Al Asayel Endurance village Organising committee and Lara Sawaya of Tasweeq announce the Endurance Ride at Al Asayel Endurance Village at Le Royal Meridien hotel in Abu Dhabi. Abu Dhabi: The Second Round of the Dr. Shaikh Sultan Bin Khalifa Bin Zayed Al Nahyan Challenge endurance ride for ladies will be held on Friday and will be followed by two endurance courses for FEI judges at the Al Asayel Endurance Village (AAEV) in Sweihan, Abu Dhabi. Addressing a press conference yesterday, Salem Al Ketbi, AAEV Organising Committee President said Friday's event is expected to provide some exciting fare as the tussle for overall champion enters a crucial phase. Friday's 100-km ride will get off to a mass start at 6.30am and the ride will be run in four loops of 30kms, 30kms, 24kms and 16kms. Two Qualifier rides will also be held on the same day. "We have 14 lady riders from the 31 who started who will be looking to garner some more points in the three-round Dr. Shaikh Sultan Bin Khalifa Bin Zayed Al Nahyan Challenge," he said. Explaining the challenge, Lara Sawaya, Managing Director of Tasweeq, said "Winners of each round will gain 130 points apart from the first prize money of Dh 30,000. Additionally, 50 Bonus Points for a rider completing all three Rounds of the Challenge and 100 Bonus Points for a rider that completes all three Rounds of the Challenge with the same horse will be awarded," Sawaya said. "Another 45, 30 and 15 points respectively for the top three best conditioned horses will also be added while a Dh 10,000 award for the Best Conditioned Horse winner of each round is also on offer," she said. The Al Asayel Endurance Village in association with the UAE Equestrian and Racing Federation will also be holding two FEI Courses for Endurance Judges, the first time in the world it is being held only for women, announced Sawaya. Ian Williams, Director of FEI Endurance will be conducting the courses. "We have 14 lady riders from the 31 who started who will be looking to garner some more points in the three-round Challenge..."
The USEF High Performance Endurance committee has recommended Becky Hart as Endurance Chef' D Equipe for the USA. Pending final approval by the USEF Executive Committee, Ms. Hart will be at the helm of the International Endurance program. With sights on a USA medal at the 2010 World Equestrian Games which will be held in Kentucky, USA, Ms. Hart will be coaching USEF National Team Riders, and will be involved in developing an effective Endurance program for the USEF. Becky Hart and RO Grand Sultan were among the USA's top performing horse and rider pairs, winning 3 consecutive Gold Medals at the 1988, 1990 and 1992 World Endurance Championships. Ms. Hart has been training winning endurance horses during the past decade as well as teaching equitation to riders. Ms. Hart will be travelling to the UAE in February, as Chef d'Equipe for the USA riders that will be competing in the 2008 HH The President of UAE Endurance Cup. Steve Rojek riding Finch, John Crandell III riding HH Saba Shams (Sonny) the 2007 Tevis Cup winner, and Kathy Brunjes riding Theatric will be representing the USA in this classic desert challenge. In the cold rajasthani desert, the marwari horse shows its mettle in endurance racing. The moon is still high above the horizon in the wee hours of a freezing winter morning. I stagger out of my tent to see a fully suited rider warming himself in front of a roaring fire. His mount has already been exercised and is raring like him to head out into the darkness. The day promises to test their skill to the limit. Horse racing is definitely the pinnacle of equestrian sport and draws massive attention worldwide. But within horse racing there is a niche called endurance equestrian that is the realm of only a few chosen mounts and their riders. 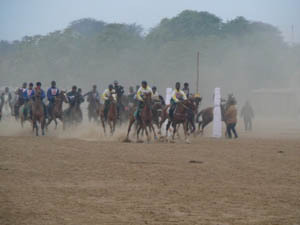 There was a chance to witness this very specialist sport at the recently concluded National Endurance Championship in the shrublands of Dundlod, Jhunjhunu district, Rajasthan. Preparations had begun months in advance, and finally the stables of Dundlod were ready to host the championship. For the five riders who rode into the darkness, a gruelling 25 km course awaited, which they had to lap four times. It was quite a sight to watch the riders set off, and to follow them in the numbing cold down the track that wound along unpaved roads, sandy tracks, gravel and fertile agricultural lands. It made one appreciate the toughness of the sport. Standard distances at an endurance meet are 60, 80, 100 and 160 km, which are rated one-, two-, three- and four-star races respectively. In general, the horse and rider to complete the ride in the shortest time are classified winners. But between laps and at the end of a race the horses undergo a medical examination for which their heart rate must be lowered to 64 beats per minute, and they must pass a check for soundness and dehydration. An unfit horse is eliminated. Preparation for the race begins very early. Horse and rider build their stamina gradually through hours of practice. The rider must master the art of pacing his horse, and learn to understand his mount’s condition to watch out for tiredness. In between each lap there is a 30-minute break, and it resembles a pit stop in a Formula 1 race. While the rider refreshes himself, the horse is cooled down, massaged, fed and watered and made to pass the medical examination. As always, there is plenty of drama. Of the five riders who set out, one has to call it a day after the first lap as his horse injures its ankle. Another horse succumbs to tiredness by the halfway mark and in the final lap it’s a head-to-head contest between two horses while the last contestant staggers in exhausted just two minutes before the race closes at 5 pm. This edition of the national championship is special because all the horses except one thoroughbred of the Indian Army are of the Marwari breed. The stable at Dundlod, owned by royal scion Kanwar Raghuvendra Singh, is famous for its pioneering efforts to resuscitate the bloodline of the Marwari. Predictably, it won the championship’s signature 100 km race. The last edition of the Asian Games in 2006 at Doha featured endurance riding for the first time and predictably again, it was the Arabian breeds that dominated because of their “incredible stamina and natural endurance”. But Singh has high hopes for the Marwari. The Marwari horse has been a favourite of the warrior classes in India for centuries. A stocky and powerfully built horse, it has starred in many previous editions of the national endurance championships. Its main advantage is the ability to adapt to most environmental conditions, and Singh says with selective breeding and sustained complete nutrition, his horses have sometimes reached a proportion of 17 hands (the height of the horse at its shoulder). “We are working for the promotion, preservation, conservation and more international recognition of the Marwari horse,” says Singh. Pieraz-Cryozootech-Stallion, the colt cloned from Valerie Kanavy's two-time World Champion Endurance horse, Pieraz, will have his first foal on the ground in April to the mare Dziupla. Born in 2005 in Italy, he now stands at stud in France. Pieraz, a gray gelding, won the World Endurance Championship at the The Hague in 1994 with Valerie Kanavy, and the World Endurance Championship in Fort Riley in 1996 with Valerie's daughter, Danielle Kanavy. In total, he won 12 160-km races. 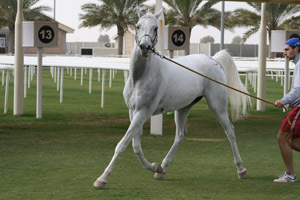 The first mare bred to Pieraz-Cryozootech-Stallion in 2007 was Varoussa, the 2000 World Endurance Championship winner at Compiegne. Varoussa is by the indomitable Persik. "To be qualified to participate in any Championship or any other CEI4* ride, a rider/horse as a combination has to have successfully completed a CEI 3* (or above) ride, the combination, in doing so, meeting the parameters and conditions as defined in art.825.4. This minimum qualification must be achieved within 24 months prior to the closing date of nominated entry." The FEI has announced that the closing date of Nominated Entries for the 2008 WEC is August 21, 2008. Closing nomination date is October 1, 2008..
1. Successfully complete the ride equal to, or greater than, the published Championship or CEI4* distance (5kms tolerance allowed). 2. Successfully complete the ride ... in a ride time equal to, or less than, 13 hours 20 mins. per 160km distance. 3. Successfully complete the ride in the same time frame as the published Championship or CEI4*"
A CEI3* completed on or after August21 2006 with a ride time equal to, or less than, 13 hours 20 mins., meets this (825.3, 3.1) minimum qualification. "Additional Qualification Criteria applicable only to Malaysia 2008. 1. Successfully complete such additional ride equal to, or greater than, the published Championship or CEI4* distance (5kms tolerance allowed). 2. Successfully complete such additional ride in a ride time equal to, or less than, 13 hours 20 mins. per 160kms distance. 3. Successfully complete the ride in the same time frame as the published Championship or CEI 4*." In order to qualify for Malaysia WEC, the same rider/horse combination must have completed TWO CEI3*rides: BOTH a CEI3* on or after September 1 2006 AND a CEI3* on or after August 21 2007. "1. Any horse qualified as per articles 825.3, 825.4 and 825.5 above that within 6 months of the closing date for nominated entries is elimiated from any FEI or National competition for Metabolic reasons, requiring immediate invasive treatment (while still under competition veterinary control), will forfeit such qualification. 2. Any rider qualifed as per the articles above who, within 12 months of the closing date for nominated entries, is eliminated from any two consecutive events (FEI or National) for Metabolic reasons will forfeit such qualification." Any HORSE which has a Metabolic Elimination (requiring invasive treatment) on or after February 21, 2008 will forfeit the qualification. Any RIDER who gets 2 consecutive Metabolic Eliminations August 21 2007 and after, will forfeit the qualification. Photo - Gulf News: Salem Rashed Bin Ghadayer (No 55) and Abdulla Thani Bin Huzaim rejoice during the presentation ceremony at Dubai Endurance Village. Abu Dhabi: Salem Rashed Bin Ghadayer on Dell Hama came up with a stirring final loop to win the Dubai World Challenge 120-km endurance ride at the Dubai International Endurance City in Seih Assalam. In another ride held at Boudtheib Endurance Village, Fakhar Ahmad on Altimo scored his and Al Asayel Stables' first ever win in a 120-km open ride while winning the Warsan Endurance Challenge. However, it was Salem Rashed's performance in Dubai which caught the eye as the gutsy rider who suffers from partial blindness started in fifth place on the final loop of 12kms. Hassan Bin Ali on Stoney Brook Scarab, who led from the second stage onwards, was first out on the final loop with Abdullah Thani Bin Huzaim, Jaume Punti Dachs and Yousuf Abdullah Hammadi ahead of Salem Rashed. But Salem Rashed, over nine minutes off the leader, urged Dell Hama and the 12-year-old gelding obliged with a speed of 26.37km/h on the final 12-km loop to finish first. Al Reef Stables Mohammad Jasem Rahimi finished second, but his horse Kentish PK Touchwood was found lame at the vet check leaving Abdullah Thani Bin Huzaim on Spendacrest Kamouflage to take the second spot. Salem Rashed, who is one of the most popular riders in the UAE, said it was Shaikh Hamdan Bin Mohammad Bin Rashid Al Maktoum, Crown Prince of Dubai, who asked him to ride the winner while Shaikh Hamdan rode Matta Mia Larry which was retired after the third stage. "This is Shaikh Hamdan's horse and he asked me to ride it," said Salem Rashid. DUBAI - The sports community within the United Arab Emirates has enthusiastically welcomed the appointment of Shaikh Hamdan bin Mohammed bin Rashid Al Maktoum as Dubai’s Crown Prince. Shaikh Hamdan, is a graduate of the Royal Military Academy Sandhurst, which is known for educating and developing outstanding leaders. The young Shaikh Hamdan is already filling leadership positions. He is the Chairman and Chief Executive of the Dubai Executive Council, Chairman of the Dubai Sports Council and he spearheads the Center for Young Business Leaders which was called into existence by Shaikh Mohammed bin Rashid Al Maktoum, Vice-President and Prime Minister of the UAE and Ruler of Dubai. Besides his official duties and obligations, Shaikh Hamdan is an enthusiastic and successful sportsman. He has won several gold medals for endurance horse races. His biggest triumph was the gold medal for the team endurance race that was won by him along with his brothers Shaikh Rashid, Shaikh Ahmad and Shaikh Majid during the Asian Games in Doha in 2006. Shaikh Hamdan also won the Zabeel Billiard Championship thereafter. Shaikh Hamdan is equally a talented footballer and took part in many friendly tournaments along with his elder brother Shaikh Rashid where he displayed plenty of skills. He was appointed Vice-Chairman of the Dubai Sports and Cultural Club a few years ago before he became the President of the Dubai-based club Al Ahli. According to Khalifa Sulieman, chairman of the club’s board of directors, Al Ahli is one of the most successful clubs in the UAE since its foundation in 1970. It took Al Ahli only four years after its establishment to win the UAE league twice consecutively in 1975 and 1976 then again in 1980. Drawing hometown fans, Al Ahli have been and continue to be one of the most popular sport teams in the UAE. After a period of decline, Al Ahli back on top under Shaikh Hamdan, winning its fourth league title in 2006 and continued to be dominating club in UAE by winning its sixth President Cup’s title. Prominent sportsmen, including Lt. General Dhahi Khalfan Tamim, Commander-in-Chief of the Dubai Police Force, Matar Al Tayer, director-general of the Roads & Transport Authority and Qasim Sultan, vice-chairman of the National Olympic Committee, Ebrahim Abdul Malik, secretary-general of the NOC and other top officials have all praised the move saying that it has come in the right time for the best interest of the sports community and the nation at large. DUBAI - Salem Rashid bin Ghadayer stayed on course to claim the Dubai World Challenge FEI CEI 120km endurance race for Shaikh Hamdan bin Mohammed bin Rashid Al Maktoum here at the Seih Assalam Endurance City yesterday. Abdullah Thani bin Huzaim was five seconds behind in second place and Mohammed Hilal Salem in third as Dhahi Abdullah Khamis followed in fourth position. Ghadayer finished strongly after completing the first 30km loop in ninth. And dropped to 10th in the next 30 kilometres before he moved to finish eighth by the end of loop three, then fourth by the end of loop four and headed the field on the last 20km loop of the day. "The field is closely grouped and looks like a wide open race at this stage. For me, it’s a great achievement which I present to Shaikh Hamdan bin Mohammed Al Maktoum," the winner said later. In the meantime, 89 riders lined up for the prestigious trophy led by Shaikh Hamdan bin Mohammed Al Maktoum, astride his 11-year-old Arabian gelding. Abdullah Thani bin Huzaim led briefly in the early stages before Hassan bin Ali put himself into contention and advanced to lead by the end of the second loop. By the end of loop three, Yousif Abdullah Al Hamadi moved to second and put much pressure on the early leader. But, the experienced rider maintained his first position through loop four and looked like a winner with 17km to go. At that point, Huzaim gave his horse a reminder and settled on the heels of the leaders with only five seconds separating between the first and third. "I think my horse did good work and has been always trotting keenly thanks to the hard work by the trainer and connections," Huzaim added. Salem Rashed bin Ghadeyer rode Dell Hama to a spectacular 1st place finish at the 2008 Dubai World Challenge. The pair left the final vet gate well behind the leaders and overtook them in the home stretch for a winning time of 4:55:54. The Dubai World Challenge was held at the Dubai International Endurance City and organized by Dubai Equestrian Club. Sponsored by Dubai World, first prize was a Nissan Patrol car, and total prize money for the ride was AED550,000. Dubai: Shaikh Hamdan Bin Mohammad Bin Rashid Al Maktoum, Crown Prince of Dubai and Chairman of Dubai Executive Council and Shaikh Mayed Bin Mohammad Bin Rashid Al Maktoum are likely to be part of a strong line-up for Saturday's Dubai World Challenge FEI CEI*** 120 km endurance ride to be held at Dubai International Endurance City (DIEC). A total of 89 riders had their horses cleared at yesterday's pre-ride veterinary check for the Dh 550,000 ride which is being sponsored by Dubai World. Apart from Shaikh Hamdan and Shaikh Mayed, consistent performers this season like Hassan Bin Ali, Yousuf Ahmad Al Beloushi and many other UAE and international riders complete the line-up. Sultan Ahmad Bin Sulayem, Chairman, Dubai World and also a top endurance rider who won the bronze at the last Asian Games in Doha said: "Dubai World attaches great importance to this sport because it stems from our national heritage and is a hobby that has been popular with our forefathers for hundreds of years." "It is of vital importance to support the efforts aiming at preserving this traditional sport through organising endurance races. "Dubai World will always support social and sports activities in the UAE in general and in Dubai in particular in line with its vision of realising the integration of all economic, social, cultural and sports sectors." General Manager of the Dubai Equestrian Club, Ali Moosa Al Khamiri said, "It is wonderful Dubai World is sponsoring what will be a fantastic occasion. "We are in the heart of the endurance season, and standards within the UAE are at an all time high right now. "Due to the increasingly high speeds of these races, leading riders will be hoping to set new world records, which should make for exciting viewing. "The Dubai Equestrian Club wishes its partners Dubai World, and the competitors and spectators alike an extremely enjoyable and successful day." Today's ride comprises of five loops of 31km, 32km, 27km, 18km and 12km, and is the sixth of eight contests to be held at DIEC this 2007-08 season. Another FEI CEI*** 120 km endurance, the Warsan Endurance Challenge, will also be held today at the Boudtheib Endurance Village in Al Khatem, Abu Dhabi. Two Qualifier rides will also be held along with the 120-km open ride and over 70 riders including 20 for the Warsan Challenge will be in the fray. Consistent performers this season like Hassan Bin Ali, Yousef Ahmad Al Beloushi and many other UAE and international riders complete the line-up.